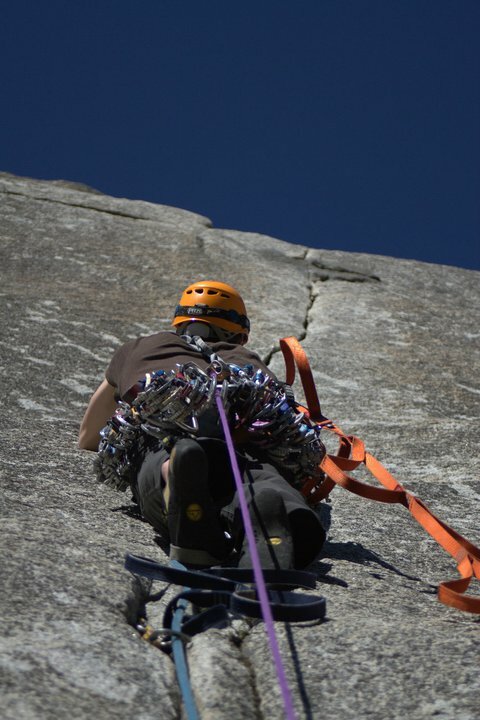 There are many subtle things that climbing teaches you, beyond using gear and climbing technique, that I think can help you live a better life. In life, as with climbing, the bigger the challenge the more (and faster) you learn; there are some interesting parallels between being successful on big wall routes and doing well in life. Personally I find aid climbing a slow, however, not being super strong, on big walls I will generally find myself doing it at some point. That said, the interesting thing about aid climbing is that the lazier you are, the harder and slower it is. Efficiency is everything. For example; let’s say you aid climb 1000ft of a route, your aiders are about 5ft long with about 1ft per step. If you are being a little lazy, you use the second step on your aider and place your gear at a ‘comfortable’ distance, instead of top-stepping and placing the gear as high as you can, the difference in height gained at each placement can easily be 2ft. Over a 1000 ft route, this would mean 330 placements instead of 200… 130 extra placements, at 3 minutes each = 390 minutes = 6.5 hours more time spent climbing. This can easily mean an extra day on the wall, which means more food and water, which means slower and harder hauling compounding the inefficiency. The point I am getting at is that, seemingly benign inefficiencies, when multiplied out throughout a route has a significant impact on your ability, and the time it takes, to reach your goal. Health; That bit of cake every day, along with a tendency to skip a bit of exercise for the odd drink after work seems totally fine, but over a period of 20 years, the extra calories in, and fewer calories out means you put on weight. Combined with a slowing metabolism and the fact that being fat makes exercise harder you ‘come to terms’ with the ‘inevitability’ of putting on ‘middle age spread’ and now your just another fat dude sweating it out on the tube wearing a suit that used to fit. Your personal projects; Most people I know have some kind of side-project. Something they are doing which is not their main vocation but would kinda like it to be. However most people I know do not work overly hard to achieve the side goal and, in reality, because ‘today was a long day at work’ or ‘I deserve a rest/treat/meal out’ or the myriad of lame excuses people use to do nothing in the part of the day don’t sell to an employer, they don’t get it done. If you spent a little over 2 hours a day on your project; it would equate to 16 hours; 2 ‘working days’ a week. If you were given 2 working days a week by your employer to do your own thing; what would you get done? The reality is that you have more than ‘2 days a week’. After a 5pm finish you have about 7hrs of usable time before you go to bed – plus your weekends. You easily have another working week within your normal ‘working week’ should you want to use it. Not using it is a gross waste of your time and does no justice to the value of your life. Financially; Let’s you like a nice coffee and a bit of cake every working day, you buy your lunch at the sandwich shop near work and you take the tube instead of cycling. Say this costs, as it would in London, £15/day. Over a year = £3975. Over 20 years with 8% compound interest; £175,000; which could give you £14,000/year in interest in your retirement and enable you to retire a few years earlier. Instead, due to a seemingly benign ‘comfort’ habits you work longer and are less financially secure. The same goes with.. maintaining relationships, improving skills and probably many other areas I have not thought of. Essentially your life, with any luck, is many years long and small comforts and lazy actions are magnified by time and can make the difference between early or late retirement, physical health or obesity, or simply meeting the goals that make you feel satisfied with what you have achieved and live without regret. This is about focus and taking risks. Speed climbing usually involves commitment and a slightly higher level of risk; you carry next to nothing so a second day would be a real problem and you are probably short fixing (leader self belays the next pitch while the second jumars/cleans) or climbing together where there is more risk of injury in the case of a fall. Whatever you want to do, doing it in your ‘spare’ time is going to be less efficient compared with doing it full time. All that time spent hauling and messing around with your job slows everything down. Being 100% committed and taking the risk, speed climbing gives you focus; the option of a night on a hard ledge with no sleeping bag and no water or food is pretty unattractive and this positive stress forces continuous action. So you want to do [thing-you-want-to-do], if you do it in your ‘spare’ time say it might take 5 years. If you focus completely; it would probably take 6 months.. this obviously depends on what you are doing and how well you use your ‘spare’ time but going at something hard and fast, although tougher, is the usually the quickest way to meet your goal. Loosely speaking, you could apply this to many sports, especially endurance activities, but for me, there is something about the big wall experience that amplifies life-scenarios in a way that, with retrospective analysis, can give clarity and insight in to the way I live my life.